Sushi Bon Warren MI Review, pics, hours, and menu info. Sushi Bon is located off 12 Mile Rd just west of Mound in Warren MI. Sushi Bon offers a wide selection of sushi as well as a Bibimbop dish. The Bibimbop is the only non-sushi item on the menu. Please do not refer to the Sushi Bon website menu as it is outdated and lists more than what is offered in the restaurant. Being that Sushi Bon only offers sushi and Bibimbop, they do it with pride and they do it well. I went there for the first time with my sushi-loving daughter. We were impressed by the quality, freshness, and selection at Sushi Bon. There were so many to choose from, and a very creative array of spicy rolls and deep fried rolls. The waitress was incredibly accommodating. 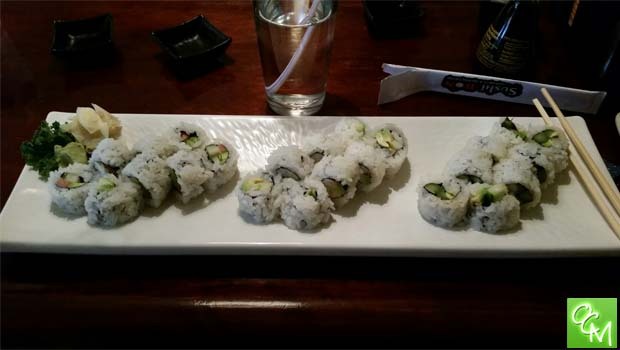 She let us know that they could customize any roll to suit our needs. As a matter of fact, the sushi ordering sheets at the table even have a comments section where you can put your specifications, e.g. I preferred shrimp over shrimp tempura, my daughter wanted smoked salmon rather than salmon, etc. Sushi Bon met all of our requests happily and accurately. Sushi Bon has a cozy Sushi bar, and plenty of seating inside the restaurant. It’s also a hotspot for carryout. We were there on a Wednesday night and many people were in and out during our short time there picking up their take out orders. The Sushi Bon menu also offers dinner course specials with several different rolls grouped into one order, as well as daily lunch specials.